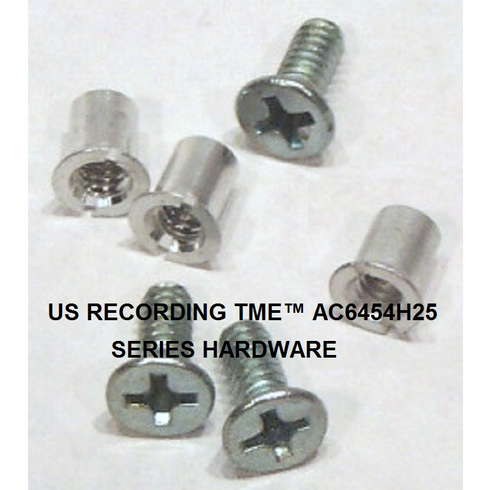 This hardware set is designed for 1/4" RMGI, ATR, 3M, or AMPEX metal NAB three screw take-up reels.. Contains 24 tested and matched screw fasteners (barrel bolts) with 24 high quality stainless steel screws for physical strength and to avoid the screw seizing. These hardware sets are a must if you're working with pancakes or if you often swap out flanges. Each pack of AC6454H25A-24 will fasten eight 3 hole NAB flanges together. Note: You can also purchase our flange sets and hubs separately and put together your own reels.